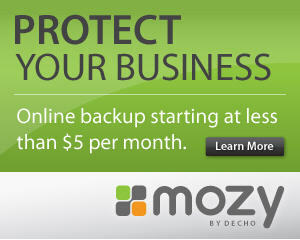 Mozy Pro is currently the best online backup service for business users that I have found. Several companies that we have reviewed here at OnlineBackupSpot.com have Windows Server backup software for their online storage and backup offering. The problem is, how flawlessly does it work? Mozy Pro, while not without a glitch here and there, is the ONLY server online backup service that ultimately did the job for us as we expected. We never did have to contact tech support to get the job done. Having a fantastic technical support team is great, not needing it, though, is even better! Mozy Pro is the big brother of Mozy Home online backup, with features that appeal to few home users but are essentials for business online backup; like open file support, locked file support and network shares. Backup of Databases like SQL and Exchange is also supported in the Pro version. Unlike other server online backup solutions we have tried, Mozy Pro supports ALL VERSIONS of Windows Server. Mac OS X is also supported for both desktop and server. Similar to Mozy Home, Mozy Pro also supports local backup, often done to an attached USB hard drive or perhaps a Network Attached Storage Device (NAS). For a set price for a particular size package you can protect unlimited PC’s and if you go with the server upgrade, unlimited servers as well. Keep in mind that you can backup servers via network shares without the extra server license but you lose the added features like open and locked file support, Exchange and SQL backup. Once you have the server license added, you specify how much storage you want to pay for. Keep in mind that you can adjust this up or down at any time really, and buying storage is reasonable. While Mozy Pro does NOT offer a free trial, they do have a 30 day money back guarantee. I doubt you will use that money back guarantee, however, because in our experience Mozy Pro just works. DISCOUNTS: Sign up for a year or more and the price comes down! Mozy Pro offers the same or better security for your data as you have come to expect in most any online backup service. By default your data is encrypted with military grade encryption before it leaves your server and heads out over the internet via an SSL connection. You do have other encryption options, including a personal key, that can make your data even more secure against any hacking attempts but I doubt most companies need to go that far. Mozy uses world class SAS70, ISO27001 data centers with on-site monitoring and security, fire detection and suppression, redundant power and networks; located around the globe. If you want the most reliable, full featured business online backup service for your Windows desktops and servers, even Mac desktops, laptops and servers, then Mozy Pro is your answer. It just works.